Akin, What Have You Carried Over? 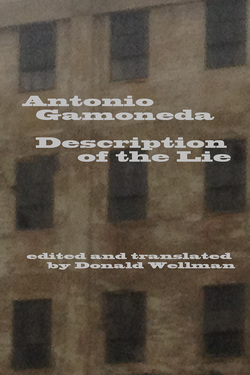 Description of the Lie is one of the few essential books from the last fifty years of Spanish poetry. Antonio Gamoneda, Cervantes Prize 2006, was born in Oviedo and, as a boy and young man, experienced the cruelest hardships of social and political oppression under the Franco dictatorship. This book, first published in 1977, bares the heart and soul of a Spain just beginning to recover from the horrors of those years. The poetry is rich in imagery drawn from the area of León where Gamoneda has lived most of his life and where he has raised his family. The book presents a unique instance of the local in all its richness and complexity serving as a liberating force. It embodies a truly national consciousness: loss, despair, compromise and recovery — aspects of Spain’s tragic twentieth century history. Description is the first in a series that includes Gravestones (Lapidás), also translated by Donald Wellman, and Book of the Cold (not yet released in English). Gamoneda’s work is valued world-wide for the incisive and innovative language with which human experience finds the necessary words for grappling with its meaning. Donald Wellman, poet, editor, and translator lives in Weare, New Hampshire. His books of poetry include The Cranberry Island Series (Dos Madres 2012), A North Atlantic Wall (Dos Madres, 2010), and Prolog Pages (Ahadada, 2009). He has written on the work of poets associated withBlack Mountain College and with emergent contemporary practices. He edited O.ARS, a series of anthologies, devoted to topics bearing on postmodern poetics, including volumes entitled Coherence, Perception and Translations: Experiments in Reading. His translation of Enclosed Garden by Emilio Prados is available from Lavender Ink / Diálogos. His translation of Antonio Gamoneda’s Gravestones is available from the University of New Orleans Press. Daniel Aguirre-Oteiza, Lecturer in Romance Languages and Literatures at Harvard University, specializes in Modern Spanish Literature and Poetry, Historical Memory and Testimony, and Literary Translation. He has translated the works of Wallace Stevens, John Ashbery, and Samuel Beckett from English into Spanish. “Daniel Aguirre-Oteiza and Donald Wellman— I cannot imagine two more sharp-eyed readers of this major Spanish poet who speaks darkly and urgently about truth and remembrance.” —Christopher Maurer (editor of Garcia Lorca, The Collected Poems: A Bilingual Edition). “Description of the Lie … raised a generational voice of strange oracular resonances, a prophetic enunciation, without ironies or emotional reserve. Fifteen years later like a typhoon no one had foreseen, it precipitated a cycle of death, in three extraordinary titles on the theme of physical collapse: three extraordinary titles culminating, that the poet believed to discern in Libro del frío (1992).” —Ángel L. Prieto de Paula, “Pasión de indiferencia.” El Pais 03/11/2012.